Technology plays a crucial role in today’s business environment, serving as an important tool that can save you time and money and increase operational efficiency. What business owners miss is that all of this technology can leave a company vulnerable to cyber criminals and malicious attacks. That’s why we put a strong focus on privacy and security in everything we do, so you can have the confidence that your business is secure. Make sure your business is secure with Total Computing Solutions security services. Contact us at (920) 569-2681 or service@tcsdepere.com to learn more about what we have to offer you and your company. Consulting: We’ll give you advice on the best security practices, covering topics such as strong password selection, detecting social engineering based phishing attempts, understanding the value of full disk encryption, understanding the risks of using “cloud” based services, and much more. Anti-Virus and Anti-Spam: We partner with Avast! to provide our clients with industry leading security software to give your team secure workstations and provide your business with a strong server security solution. Encryption: Through our partnership with DataGuard Hosting, we are able to provide e-mail encryption both in transit and at rest to maximum extent possible. DataGuard hosted e-mail service includes highly effective junk mail management and anti-virus capabilities. We also offer full disk and volume based encryption for all workstations and servers. Secure Wireless Networks: We have a wealth of knowledge in setting up extensive wireless networks, offering secure and appropriately segregated and prioritized access for staff, guests and other groups as appropriate. We have a breadth of experience in IT security and are equipped to handle just about any security task required of us. In addition to these services, we also have experience in providing ethical hacking, web content filtering systems, and countless other security procedures to provide you with the maximum level of IT security for your business. 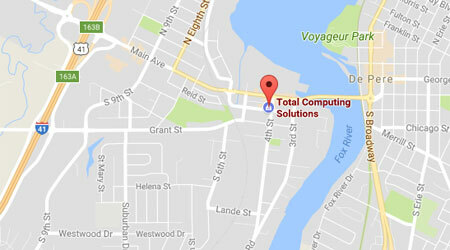 (920) 569-2681 or send an e-mail to service@tcsdepere.com to speak with a member of our team about what Total Computing Solutions can do to improve your business’ IT security.